I will never get why the WWE has a tag team division. We have the Uso’s, The Bar, The New Day, Sanity, AOP, The Revival, The Good Brothers, The B Team, The Ascension, Epico and Primo, Breezango, and then… you have the thrown together champions: Gable and Roode and now, Miz and Shane as ‘Team Daddy Issues’. Not to mention, they just threw Nakamura and Rusev together…good grief. They bring up Heavy Machinery, but why? NXT teams seem to have a shorter life span than TL Hopper or the Goon, and its not for lack of talent. So why the heck are these teams that were successful in NXT not translating on Raw or Smackdown? It’s a mind-boggling question, because if you watched NXT UK Blackpool or NXT Takeover Phoenix and the Drake and Gibson vs Moustache Mountain and The War Raiders against the Undisputed Era tore the damn house down in opening matches. These teams got a solid amount of time on a PPV to show what they can do in the ring and they did not disappoint at all. So, I ask why can’t the WWE creative team and writers use a Revival, American Alpha, AOP, Sanity, etc. correctly and run with teams that lit up NXT? Hell, why is it that Smackdown has the most lopsided tag team division in the history of the WWE? Check this out. Uso’s, The Bar, The New Day account for the last 16 title reigns on Raw and Smackdown and they are all on Smackdown. Raw has: The Revival, The B Team, Breezango, AOP, and the Ascension. Does this seem like the teams are evenly split between to the two shows? Hell no! Yet, there is a need to throw two singles wrestlers together to form a team. It’s no wonder the Young Bucks or Briscoe’s never signed with the WWE. It’s no wonder the Revival is trying to get out of their contracts to move because they see how this is heading for teams coming out of NXT. Pushes lead to no man’s land or nowhere in general. Welcome to the mismanagement of a tag team division. Watching I can see some missteps that have happened with some of the NXT tag teams that have come up, some controllable and others out of the wrestler’s hands. Here’s my breakdown. The Revival: I picked on the Revival a couple weeks ago, and I stick by what I said: Dawson and Wilder had some injury problems and that derailed any plans for a decent run. I personally think injuries are out of the wrestler’s hands. You can’t control a torn ACL, blown knee cap, or broken bones to name a few. But the Revival going from solid matches with DIY to jobbing to the Lucha Party to me is a slap in the face to Triple H and NXT. American Alpha: Here is another team that seem to get pushed too far to fast. It seems like any momentum they had coming out of NXT was short lived because of some bad booking and over hyping. Not Jordan or Gable’s fault. Before we even blinked Jordan was on Raw playing Angle’s kid and Gable was in singles matches doing okay, but not setting the world on fire. Thank God for Bobby Roode. Authors of Pain: Vince McMahon’s hard on for hating on Paul Ellering started this downfall before it began. Here are two monsters that come out and throw their NXT manager away after one Raw appearance. Then they win the Tag Titles with a ton of help. Name one old school wrestling team that needed help to win when they were billed as monsters? I don’t know how Drake Maverick was supposed to supply an intimidation factor, but it didn’t seem to work. Nuff said. Sanity: I am an Eric Young mark. I thought Sanity got the call too soon and they rarely if ever appear on Smackdown. The biggest problem I can see with this team is a lot of people were asking right off the bat, where is Nikki? That seemed to doom three very talented wrestlers. Maybe sending them to Raw will help or now that Nikki is up getting her as part of the ground and letting them run rampant will revive them? The Ascension: I get members were replaced and the team continued to go. But this is a team that seemed to never get their footing in Smackdown or Raw. 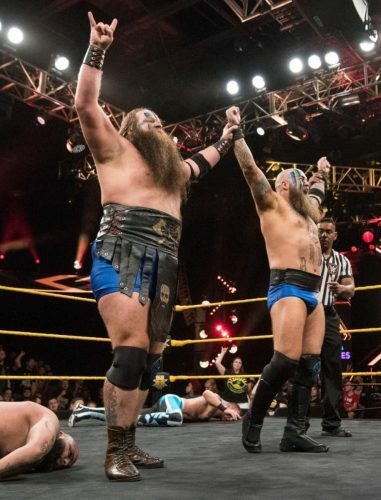 They have a look, seem to be athletic, but the face paint and other gear never translated to a fearful team or dominate team like they were in NXT. Changing members was really a killer here. And, the departed Vaudevillians: At first glance this is a team with a pretty unique gimmick, but it didn’t amount to much on Raw or Smackdown. Gotch got heat on himself with backstage antics and was released, English became a Lana stalker from a mouth piece and is probably stuck in dark match hell. Victims of creative and their own stupidity. If I was the War Raiders, The Forgotten Sons, The Street Profits or Undisputed Era, I fret getting a call from Raw or Smackdown at this point because these are teams that could have a bright future. The sad thing is, the bright future might be staying in NXT and not making the main roster. Because it is pretty evident the WWE doesn’t know what to do with pure tag teams. Long gone are the days of the Killer Bees, British Bulldogs, Hart Foundation, The Islanders, Demolition, the New Age Outlaw, APA. the list goes on and on. Hopefully Heavy Machinery isn’t the next casualty on this list. They seem to have an upside and connect well with the fans. Unfortunately, that doesn’t mean much when it comes to the WWE. A loaded roster and misused teams seems to be an excuse for throwing the Tag Titles of either show on singles wrestlers – just to appease an ego here and there. Oh well, it’s only a matter of time before Miz and Shane implode, and we have another broken pairing. 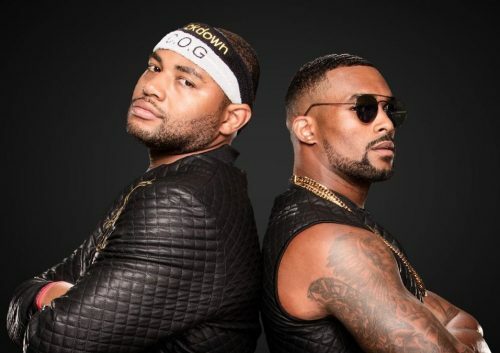 The WWE is single handedly redefining the term “Tag Team Turmoil”.